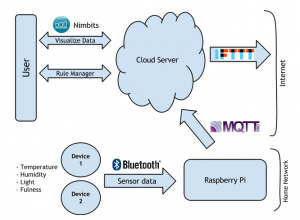 Open IoT Challenge: some very cool projects being developed! Over the course of the last couple weeks, the participants who entered the Open IoT Challenge have started working on their projects. They are all documenting their journey on our dedicated Tumblr, and to be honest I’m very excited to see what they are doing: keep on reading for a quick update on some of the work done by the challengers so far. Tobiasz Dworak is working on a nice project that will be solving a typical problem in the industry: bridging legacy sensor networks to the Internet of Things. 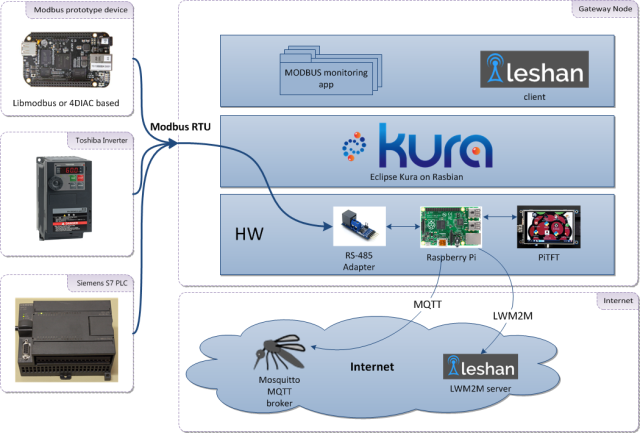 Typically, industrial automation equipment can be controlled using Modbus, so Tobiasz is proposing to implement an app on top of the Kura application framework to allow Modbus devices to be controlled from the Internet of Things, using MQTT and LwM2M. There should also be a local LCD display allowing to interact with the system. If you are interested in learning more about Kura, you should really follow Davide’s project. 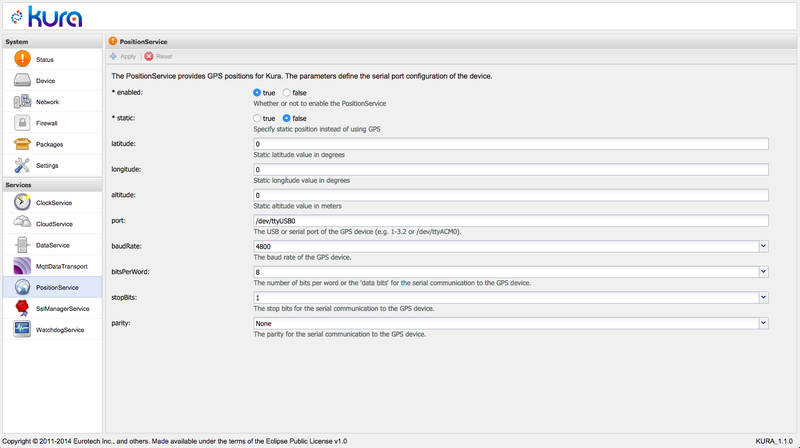 Davide is building a cloud vehicle monitoring system by leveraging the Kura capabilities to interface with GPS devices and CANbus, and will use the Solair Application Platform for cloud data management. Davide has been doing a great job of documenting his progress so far and you can really learn a lot on Kura and OSGi development by following his blog. watr.li – Building the Internet of Plants! 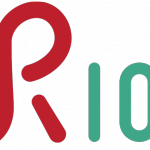 RIOT OS is a pretty cool operating system for the Internet of Things that targets tiny computers and MCUs. Watr.li is a great project by a group of people involved with the development of RIOT, who want to build the Internet of Plants. They are building on top of 6LoWPAN and CoAP and will be creating sensor nodes (measuring the humidity of the plant) as well as a display node (a Raspberry Pi, that will bridge the 6LoWPAN network to the Internet and expose a web interface). This one is just getting started but Emir and Utku have the ambitious goal of building an automated system for monitoring the jars and containers that we all use for our food, spices, etc. IoNeeds storage boxes and jars have light, temperature and humidity sensors and ultrasonic sensor for measuring fullness, and they will be connected to the Internet of Things to let you optimize your budget by giving you statistics on your consumption, or automatically order new products to refill the jar. The most difficult aspect of developing an IoT solution is probably that one has to deal with the –embedded– hardware that will eventually run the application that talks to the sensors, thermostats, car entertainment, etc. Embedded is definitely complex: the resources are limited, the development tooling usually sets you back a decade, etc. But when you have figured out your hardware, you need your devices to actually “talk” to the cloud. And there comes the not so trivial problem of finding an open and publicly accessible server to talk to. This is why Eclipse IoT has been proposing an MQTT broker an M3DA server for a while. Many people use them for connecting their prototype solutions, before actually moving to a more production-ready environment. Last week, we deployed two new open IoT servers at iot.eclipse.org. CoAP is an UDP-based protocol for IoT that mimics the REST paradigm in an IoT context. 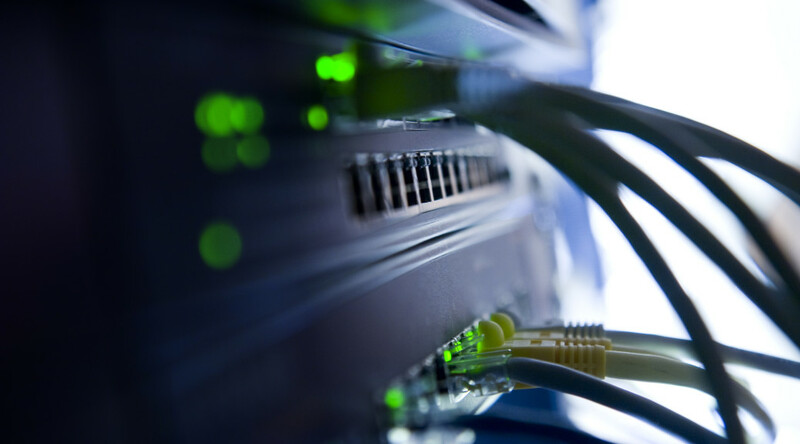 It provides an elegant and efficient way to do sensors monitoring on very constrained networks. A CoAP server exposing test resources is now available at coap://iot.eclipse.org:5683 and is open for anyone to interact with, whether it’s for learning more about CoAP key principles, or for actually testing a client implementation against it. OMA Lightweight M2M aims at proposing standard resources and workflows on top of CoAP for Device Management. The freshly deployed LWM2M sandbox at Eclipse provides a nice way to connect LWM2M capable devices and monitor them using a web UI and REST API. It runs the Leshan open-source LWM2M server. If you’re actually interested in learning more about CoAP and LWM2M, you probably want to check out this presentation from Julien Vermillard at EclipseCon 2014. Header image is splorp via Compfight.